In the summer of 2012 I took a trip to Alaska and published an initial post on my reactions to it. 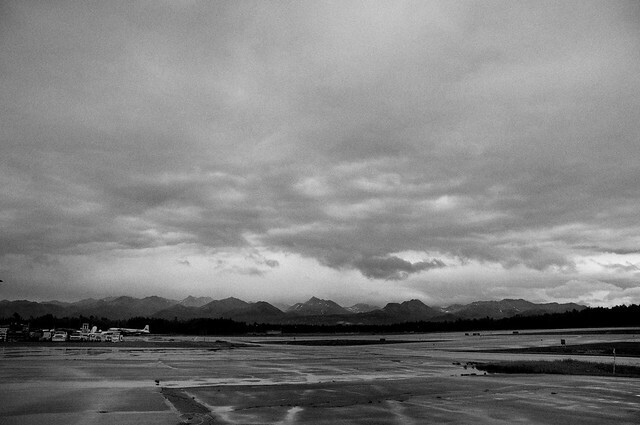 Titled I Went To Alaska and All I Got Was This Lousy Feeling, it described how I had gone from sad to sadder during my stay in Alaska; granted, I was only there for 4 days, but it was enough to get what I felt to be a real sense of the place. Desolate, remote, and depressing. That post was accompanied with shots taken with my phone, and I promised to post some of the images I had captured with a camera at a later date. Well, (I’m afraid to say) that date has arrived. Like I generally do, I put the photos away and did not look at them for several months. This is habitual and intentional; it helps me when I’m editing photographs to have some emotional distance from the actual images, so that I can evaluate them more objectively. Anyway, I pulled out the files and went over them again over the past few days. I have to say–looking at them now, my impression of the place hasn’t improved much. I still have a pretty sad view of Alaska based on the time I spent there. 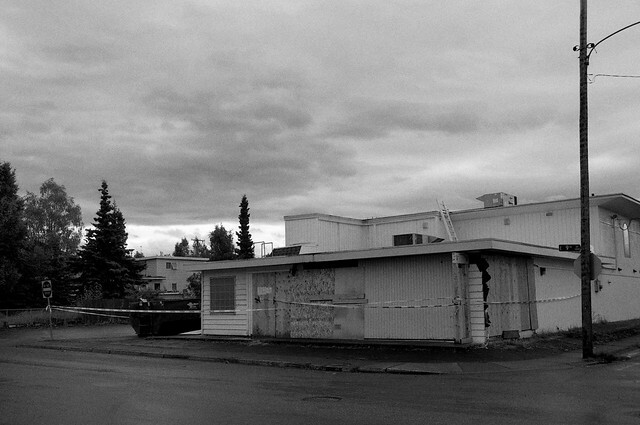 In this part of the series on Alaska, I have a set of black and white images to share of the city of Anchorage, and in the final post yet to come there will be a set of color street shots from Anchorage. 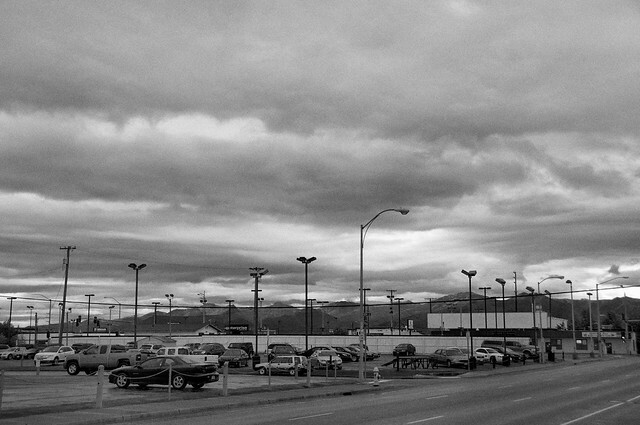 Anchorage, as far as I went, felt very empty. There were abandoned buildings, empty lots, and a lot of spots that looked worse for wear. I think that the tourists might not see this part of the city, or of the state of Alaska, since it’s a bit off the beaten track. But if you really want to get a sense of a place–if you really want to know a place instead of just visiting it–then you have to go where the people are. That’s what I did in Anchorage. After walking through the tourist areas downtown I set off in the direction of the mountains, opposite of the water. 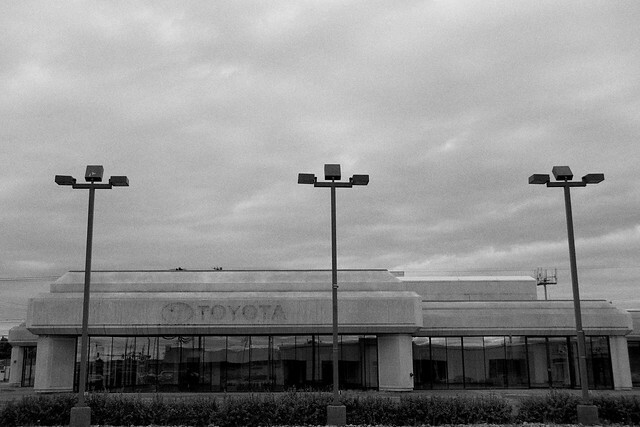 I found neighborhoods that were pretty desolate. Buildings abandoned and left standing alone. Homes that are dilapidated, streets that need paving, broken-down cars and trash littering yards and roads and sidewalks indiscriminately. People wandered around, without apparently having anywhere to be or anywhere to go, spilling out of bars at all times of the day in various levels of consciousness. Aside from the depressing reality on the ground, there was another thing that caught my eye–and my lens–consistently. 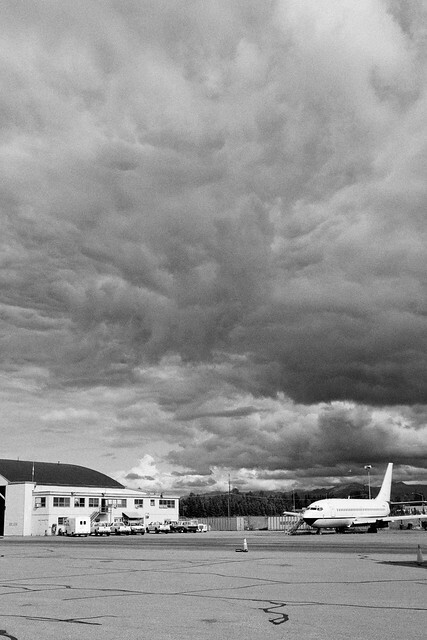 It was the sky above Alaska. Not only large, but foreboding, gloomy, and almost alive. It seemed, at times, to have a personality all its own. I didn’t see the sun the entire time I was in the largest state in the union, but the clouds had a way of talking to me and conveying the emotion of the place as I strode through the town, trying to see all I could. In the end, these are some of the photographs I took that really evoke the memories and feelings I felt when I was there, staring up at the sky and attempting to soak up the feelings of the place. That sky seemed to go on forever. The next set from Alaska will feature a different mood and a different set of images, which are closer to what I am used to posting. Perhaps they will give a different feeling than this set, and the last set I posted from my phone. If you have any questions or comments, I’d love to hear them. Do you have any experience in Alaska to confirm or contradict mine? By no means am I the ultimate authority on the place, and I don’t pretend to be, and I can only present my view of the place as I experienced it over the four days that I spent there last summer. Perhaps a return trip is necessary to form a more nuanced view of the place. Then again, the cruise ship-hopping tourists won’t have gotten the slightly more full view that I had access to and likely won’t have hiked into the interior of the city, and into the neighborhoods that I found. You really captured your feelings for this town in an excellent way! It looks empty and boring…. Well, thanks! That’s really great to hear. I was concerned people would find it too negative. I’m glad you enjoyed it. I’ve always thought that you have a real eye for skies and that’s clear in this post. The images really do capture that big, empty feeling. “Grimace” and “Alaska International Airport” or my favorites.